If you have been looking for a new dining destination that has both contemporary and urban elements, then I have got the spot for you! The Orchard House is a warm yet spacious setting, with wooden tables, comfy banquettes, and just the right amount of funky – the wallpaper and “graffiti” on one of the walls was really quirky and fitting. LES all the way, baby. The cocktails at The Orchard House are mixology style, and I am a bit picky when it comes to my drinks – I don’t like too sweet, and I don’t like too strong. To me, a good cocktail is based on the balance of flavors, not the sting of alcohol in your esophagus. I had some mango-sage concoction that was really tasty, but, too sweet. Strike! Alexis had something with tequila and thyme in it. This much I know. It was called the Tequila Garden, and she said it was great. So…50% success rate. The appetizers were more like a 100% success rate, and that’s where I’d like to see success anyway. Alexis and I share the same love of food, and love of variety of food. Fortunately, the menu at The Orchard House sounded delicious from top to bottom, left to right – it was actually hard to choose – so we had ourselves a little tasting. 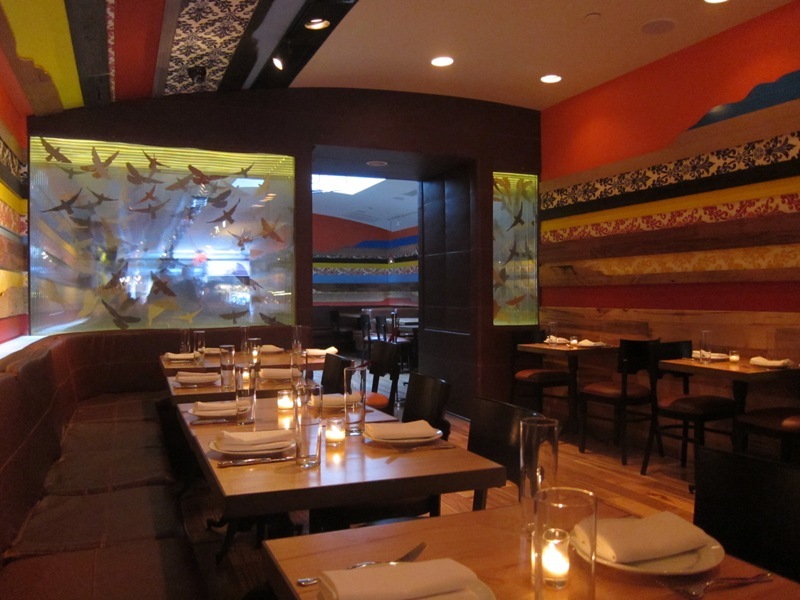 When in Rome…or the LES. 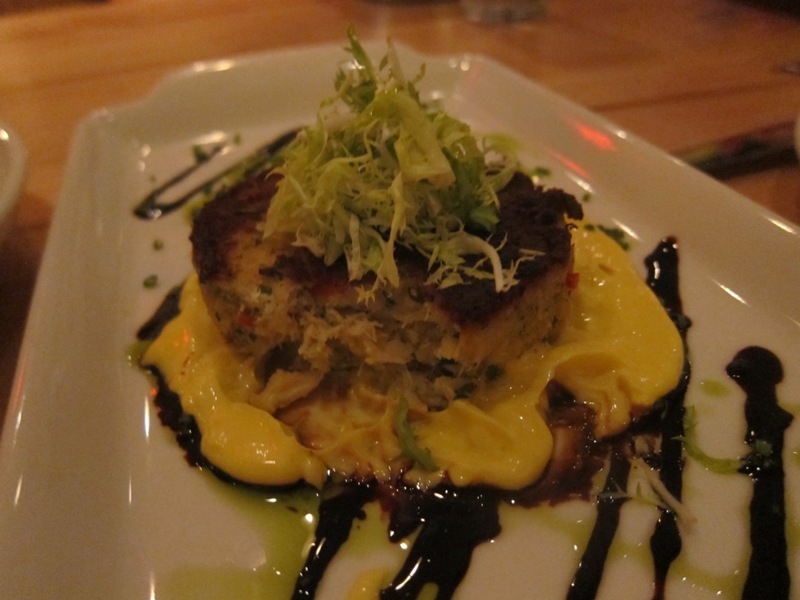 The crab cake with basil oil balsamic glaze and garlic aioli was a great starter – a lot of textures here with a nice toasty crust and inside the moist, savory crab and cool aioli. Great dish. 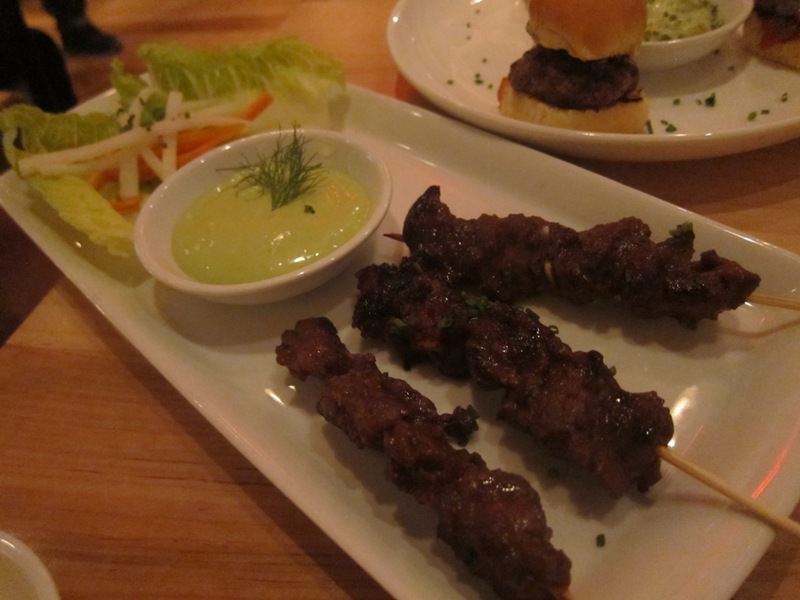 The beef skewers with Thai basil dip were probably my next favorite appetizer. I grew up eating what my Dad likes to call “steak on a stick” – pieces of overcooked, slightly charred meat on a skewer from the meat carts on the streets of the Manhattan and Queens. Now, this is also technically “steak on a stick”, but the components and end result are slightly different. 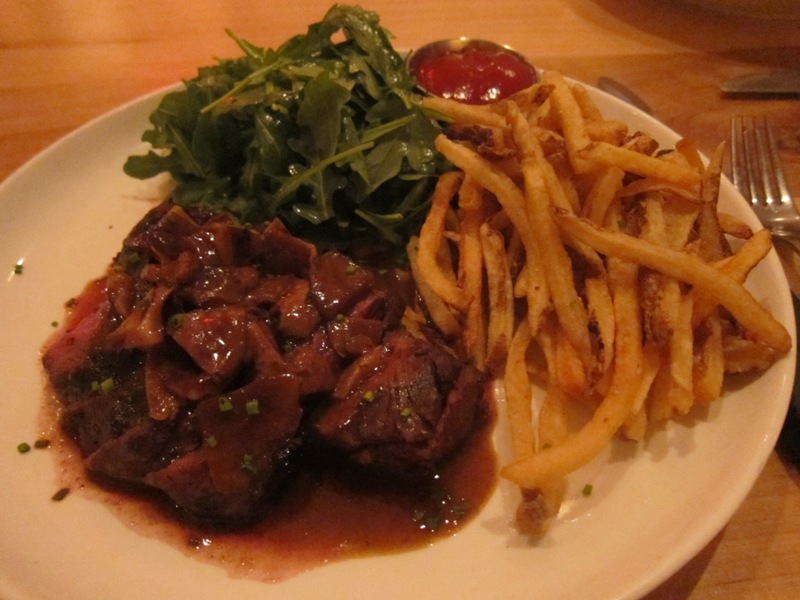 These chunks of beef were a little sweet, super tender, and the basil dip was a great complement. We polished those off pretty quickly. Sweet and savory steak on a stick.. There are two bar-food staples that I can’t resist: wings and sliders. If you haven’t been paying attention thus far, The Orchard House likes to play with the staples and give them a twist. 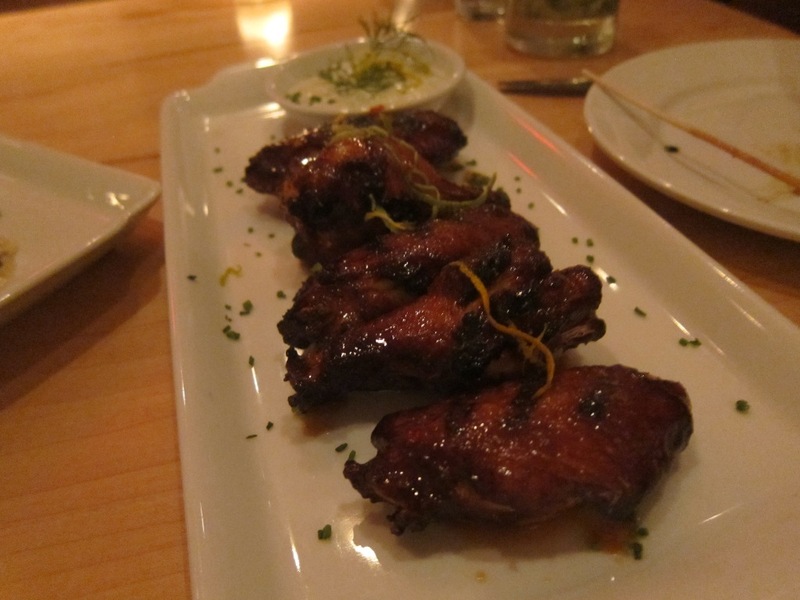 I love basics but I also love twists – the chicken wings here are grilled and swiped with a spicy citrus glaze that was sticky and wonderful. The dipping sauce was a cilantro yogurt – and as much as I despise cilantro, it wasn’t bad. I guess. I just can’t do cilantro. 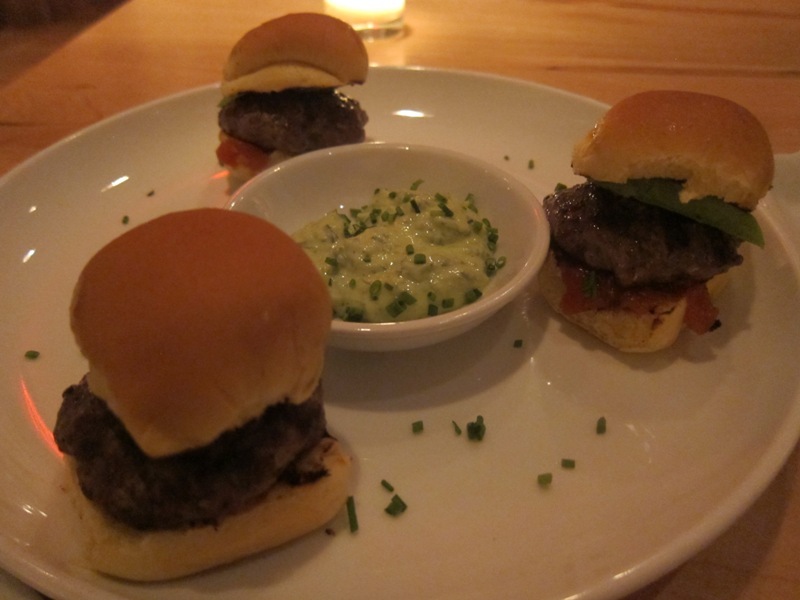 The sliders were made with lamb and they were also a home run – topped with a tiny wedge of avocado, then add a dollop of ketchup, and you’re good to go. Warning to pasta lovers: this next dish is extremely dangerous! 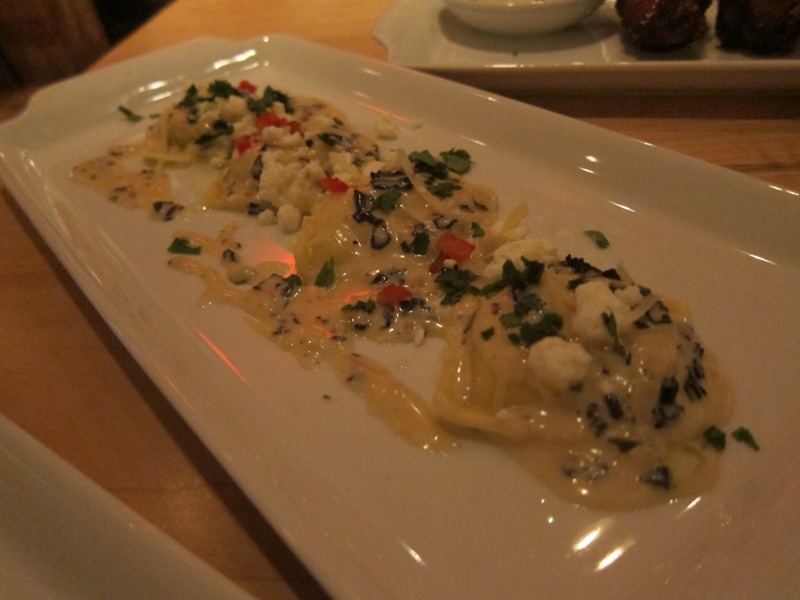 It comes in an entree size and an appetizer size, and it’s topped with a creamy black truffle sauce. You can’t avoid it – you literally have no excuses. Unless you don’t like truffle, in which case, I don’t want to know you. 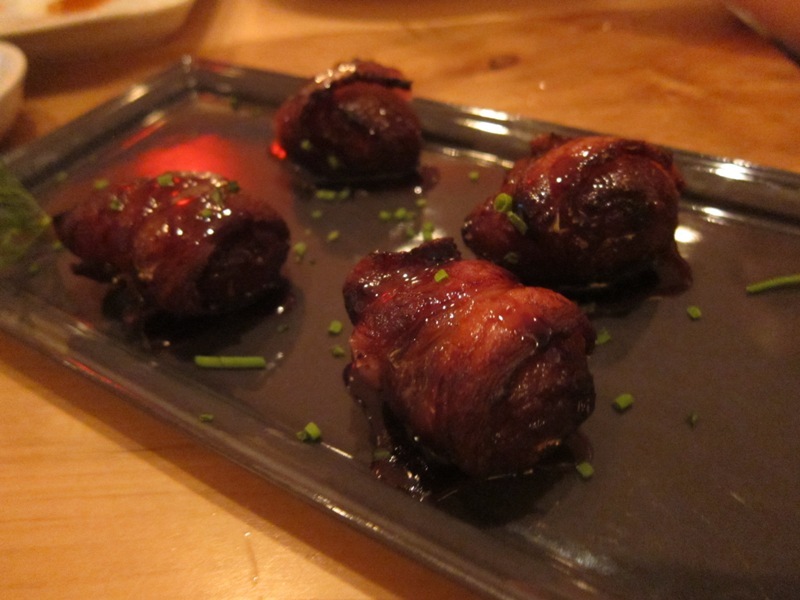 When you hear an appetizer with a funny name like “Devils On Horseback”, you try to figure out what it might be. If you guessed dates stuffed with cheese, chutney, and wrapped in bacon, you’d be right! Good guess. These were a sweet and salty mix of gorgonzola, dates and bacon. Yum. I would actually love to know where this originated from (I know what I will be Wikipedia-ing later..), but either way, easily one of my favorite appetizers next to deviled eggs. Apparently I have a thing for all things deviled..
Just a good piece of meat.